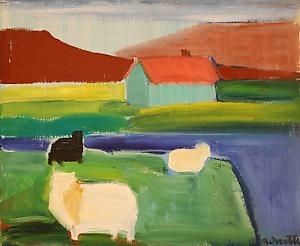 Reykjavik-born Louisa Matthiasdottir (1917-2000) moved to New York in 1942 and studied with Hans Hofmann. She painted severe, crystalline still lifes, portraits, and landscapes of Paris and Maine. But she is probably best known for those landscapes, painted from memory, of the sheep, houses and horses among the fluid skies, fields and coastline of her native Iceland. Elegant and spare, and nearly abstract, her plain-spoken pictures are beautifully exact. This compact show of 16 small landscape paintings mostly from the 1970s and 1980s includes some jewels. "Blond Horse" (c. 1985), solid as stone, creamy as butter, is natural yet monumental. "Tan Sheep in Landscape" (no date) takes us from a tiny grazing flock to tall mountain peaks. The gorgeous and golden "Icelandic Farm" (c. 1978), depicting a cliff jutting over buildings, fence and countryside, is distinctly modern yet expresses the poeticized naturalism of a Sienese landscape by Ambrogio Lorenzetti. This slender gathering of paintings does not reveal the breadth, mastery and magnitude of the artist's talents. But by all means see the show. In fits and starts it conveys the lyricism and effortlessness of Matthiasdottir's piercing vision.